Saturday’s most lucrative game is our $12,500 Guaranteed event (races TBA as of this writing) with payments down to 6th place and $6,250 going to the winner. With our takeout rate of just 10%, you won’t find a better proposition anywhere this weekend. You could also attempt to win a package ($500 entry plus $750 travel) to next month’s Orleans Fall Classic…or a $1,500 seat to the 2017 Horse Player World Series. We’ll be offering one Orleans package per every 15 entries at $97 each — and one $1,500 HPWS entry per every 20 entries at $87 each. Both tournaments are Pick & Prays so, in case it’s your day, why not enter both? Saturday is also your last chance to play in a low-cost feeder to the next day’s The Big One direct qualifier. Entry fee for the Saturday feeder is $106, with one in five moving on to the Sunday qualifier, where the entry fee is obviously higher. Any interest in an onsite tournament limited to 57 players that gives away 10 NHC seats, 8 BCBC seats, 10 HPWS entries plus cash? We thought so. The bad news is that Sunday is your very last chance to qualify online for the Sept. 24-25 The Big One at Laurel. Entry fee for this “last chancer” is $478, so if you don’t succeed in our Saturday feeder, be sure to take a swing on Sunday. Two The BIG One packages are guaranteed to be awarded. These packages include your $1,000 live bankroll, a complimentary three-night hotel stay, an additional $500 in travel expenses, plus food and open bar Friday night plus Saturday and Sunday during the two days of contest action. At The BIG One, you’ll be treated like a BIG shot. There’s another major qualifier on tap for Sunday in our 3-seat-guaranteed NHC qualifier which carries an entry fee of just $160. And if we hit 280 participants, we’ll toss in a fourth seat. In addition to the three or four NHC berths, NHC Tour points will be up for grabs as usual for you NHC Tour players. 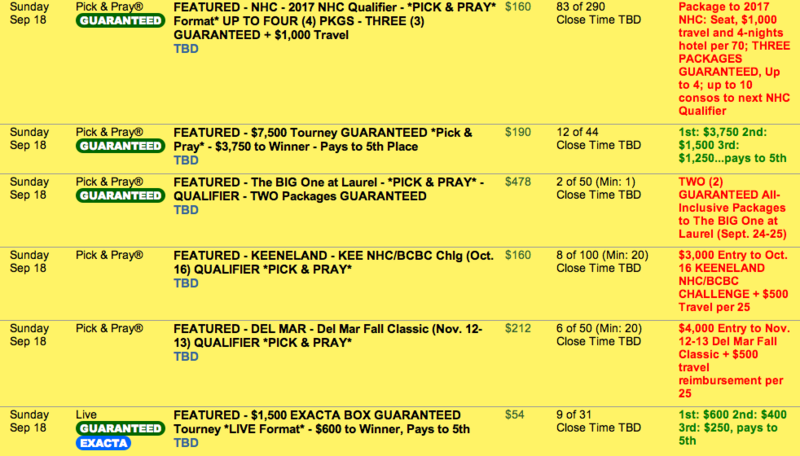 We’ll also be hosting direct qualifiers on Sunday for the Keeneland NHC/BCBC Challenge ($160 entry, one $3,500 package winner per 25 entries) and the Del Mar Fall Classic ($212 entry, one $4,500 package winner per 25 entries). There’s a lot on the line this weekend, so happy handicapping and may all your horses break sharp and finish strong. Good luck!